Hanna, S., Conley, S. P., Shaner, G., and Santini, J. 2008. 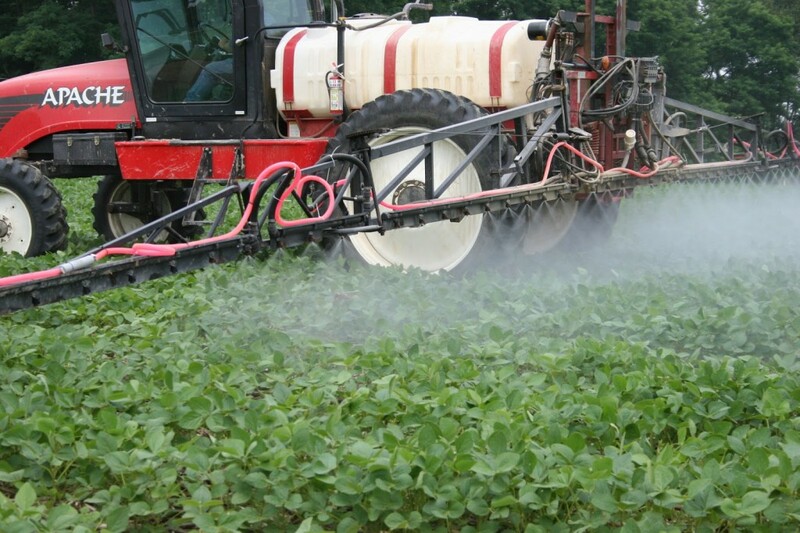 Fungicide application timing and row spacing effect on soybean canopy penetration and grain yield. Agronomy Journal: 100:1488-1492. 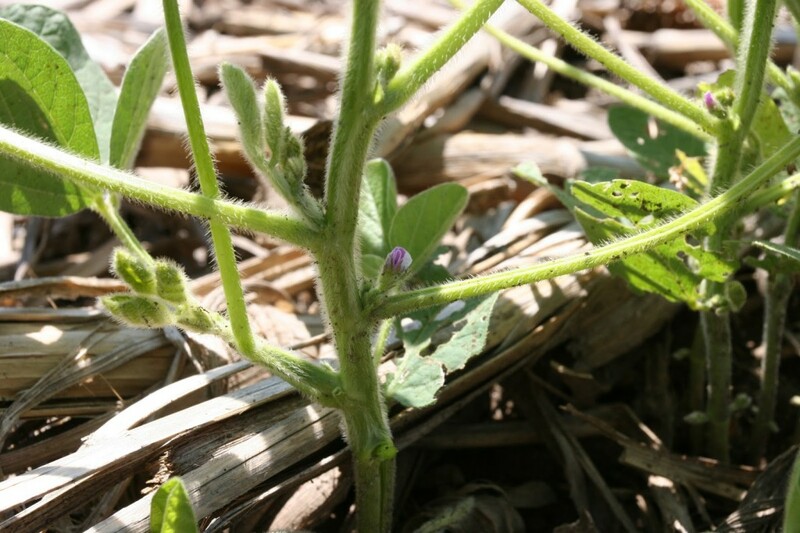 Given the quick start to our soybean growing season we will begin to see many soybean fields begin to flower (R1) next week (6/21/15). As we enter the soybean reproductive growth phase there are a few things to keep in mind. The first is that soybean will produce flowers for ~3 to five weeks, depending upon planting date and environment. During that time soybean will abort anywhere from 20 to 80% of the flowers that they produce. Generally it is the first and last flush of flowers produced that are most likely to be aborted. Next, the timing window for glyphosate applications in our early planted soybean is quickly closing. Glyphosate labels indicate that applications can be made through R2 or full flower. The R3 growth stage begins when one of the four top nodes with a fully developed leaf has a 3/16 inch long pod. Applications made after the R3 stage begins are off-label applications. On average it takes ~ 4 days to move from R1 (beginning flower) to R2 (full flower) and ~10 days from R2 to the start of R3 (beginning pod). Last but not least, wheel track damage made from ground applications may start to reduce yield. Sprayer wheel traffic from first flower (R1) through harvest can damage soybean plants and reduce yield (Hanna et al. 2008). Our research suggests that an adequate soybean stand (more than 100,000 plants per acre) planted in late April though mid-May can compensate for wheel tracks made when a field is sprayed at R1. 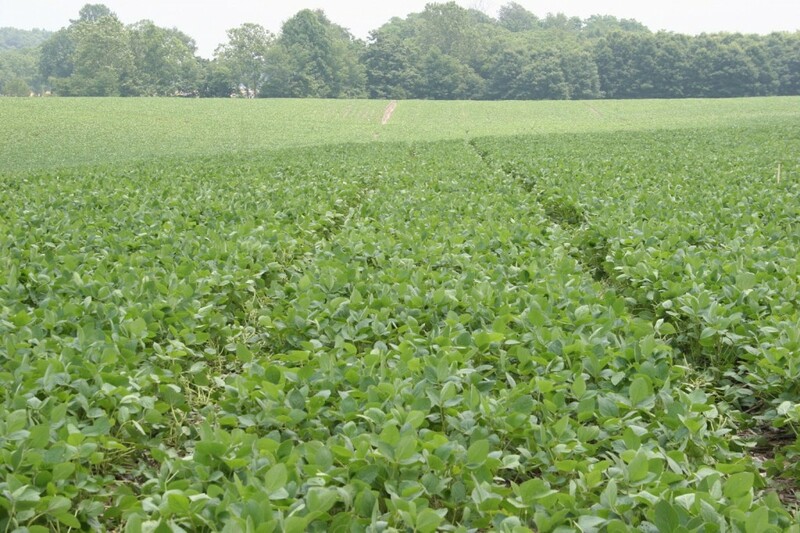 Yield loss can occur, however, when wheel tracks are made at R1 or later in thin soybean stands (less than 100,000 plants per acre) or late planted soybeans. Regardless of stand, plants could not compensate for wheel tracks made at R3 (early pod development) or R5 (early seed development). The average yield loss per acre is based on sprayer boom width (distance between wheel track passes). In our trials yield losses averaged 2.5, 1.9, and 1.3% when sprayer boom widths measured 60, 90, and 120 foot, respectively. Multiple trips along the same wheel tracks did not increase yield loss over the first trip.